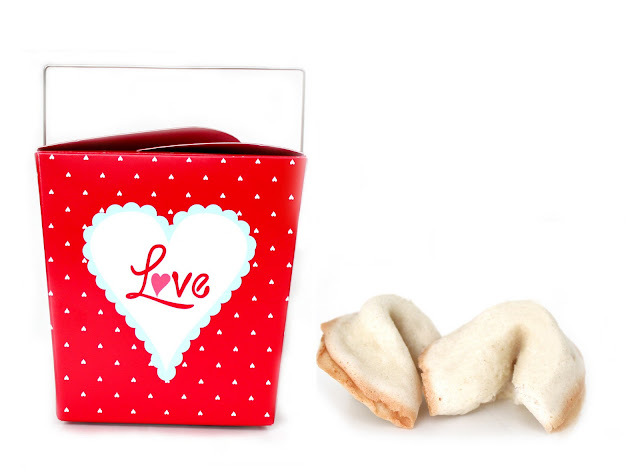 Write your Valentine their own fortunes and put them in cookies. Mix the egg white and vanilla until foamy. Sift the flour, salt, and sugar and blend into the egg white mixture. Start off making one or two at a time. Place 1/2 tablespoon full of the batter at least 4 inches apart on one of the prepared cookie sheets. Be careful to make batter as round and even as possible. Bake for 4-5 minutes or until cookie has turned a golden color 1/2 inch wide around the outer edge of the circle. The center will remain pale. While one sheet is baking, prepare the other. Remove from oven and quickly move cookie with a wide spatula and place upside down on a wooden board. Quickly place the fortune on the cookie, close to the middle and fold the cookie in half. Place the middle of the folded edge (not the side where the outside edges of the cookie meets) vertically across the rim of a cup and pull the pointed edges down, one on the inside of the cup and one on the outside. You must do this while the cookie is hot or it may break. Place folded cookies into the cups of a muffin tin or egg carton to hold their shape until firm. I will not be doing this because I will burn the house down, but I love the idea. When my bf was at spring training for Valentine's Day (of course because MLB is plotting against all couples) I sent him a giant fortune cookie dipped in chocolate. Apparently I was very popular amongst his roommates that week lol. what an awesome idea! I would love to make this! Awesome! I haven't thought of this as an option, cute! ... Doesn't seem hard, I'll try them and let you know if I succeed! Have a lovely day dear! I really want to make these! This is such a great idea! I love fortune cookies. oh this is soo cute!!!! Very good Valentine's Day suggestion ! I made fortune cookies as part of my wedding guest favors! I'm part Chinese, so it worked. :) Inside it read: "Hubby + Finley: Fortunate to find each other." And I think on the other side it had quotes about love. I don't remember now. Wow - how unsentimental of me! حيث تم تصنيفنا من بين أشد مؤسسات التغليف تماما، نتيجة إلى اعتمادنا لاستعمال أجدد الأدوات وأجود أشكال التغليف بأساليب احترافية وبمهارة عالية تحت اشراف عالي خلال تطبيق الخدمة حتى تحصل على أعلى جودة ممكنة.